Michael Pollanâ€™s newest book, In Defense of Food, has a simple, 7-word message written across the head of red leaf lettuce that graces the cover â€¦ EAT FOOD. NOT TOO MUCH. MOSTLY PLANTS. If healthy eating is really that simple â€“ why have we made it such a complicated process? The answer, Pollan claims, lies in what he calls â€œnutritionism.â€ Defined as â€œthinking about food strictly in terms of its chemical constituents,â€ Pollan blames corporations, agribusiness, and foods science labs for kidnapping not only our food supply but our common sense as well. â€œNutritionism has created an environment in which we supposedly need experts to tell us how to eat. What ever happened to grandma’s common sense cooking?â€ Pollan asks. Since World War II, our food has become so increasingly processed that a majority of Americans are now living on chemicalized, food-like substances that in no way resemble the food that their grandparents and great-grandparents enjoyed. Government regulations allow many of these processed foods to be marketed as healthful, and journalists lead us to believe that everything done to our modern food products is good for us. And are we healthier because of the experts? â€œNo!â€ says Pollan and goes on to prove that the nutritional advice coming from mainstream media over the last century has made us â€œless healthy and considerably fatter.â€. So what can we do to take back our kitchens from Monsanto and enjoy what we eat without nitpicking every morsel that goes into our mouths? Pollan outlines his plan of nutritionism recovery by detailing each of his three original directives: Eat Food. Mostly Plants. Not too much. Michael Pollan is a talented writer, author of two previous bestsellers and a regular contributor to the New Yorker Magazine. His style is sophisticated and witty, and his knowledge of the subject convincing, making In Defense of Food both compelling and entertaining. Become a defender of food. 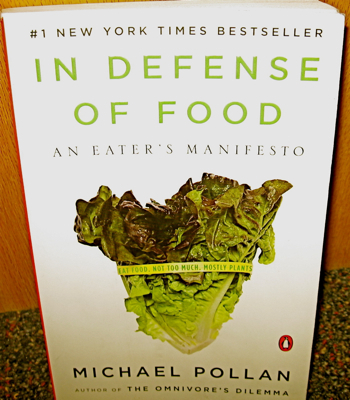 Pick up a copy of Michael Pollanâ€™s book, In Defense of Food. *For about two years, I have been doing book reviews for Freshlife’s magazine Profiles, where this appeared. Barb, the owner, co-authored this review. Go to www.freshlife.com to sign up for the daily, helpful, emails called freshmail. You can also order the book from Freshlife. Note: I wrote this non-rhyming poem several years after my divorce. I found it this weekend in an old notebook and decided to post it on its own, since I am not sure where it belongs in my manual, which I will start to post as soon as I sort through a few more files. But this one, written in two parts, seems important enough to post now. Healing takes a long time, but it comes.. I promise! Yet darkness poured over me like an endless night. I struggled with the words, as my husband sat opposite me, cross-armed. The words I uttered in earnest fell on impatient ears, already closed to love. Our marriage was in shreds, and like Humpty-Dumpty, I couldn put it back together again. I babbled on & on, digging a deeper hole, falling into complete darkness. As if a knife was embedded so deep in my heart I could not pull it out. Dripping blood on every step as I retreated up the stairs. I cannot recall the love he once professed again & again. And when the sun pours through my living room window, the darkness has disappeared. Perhaps even stronger than before. And now, while I still remember, I am much larger than the pain. P.S. When I was in the throes of distress, I often found a “sad song” was needed to reflect my mood. I wish Lonely Motel was written then, but it is a brand new song written & sung by Jay Jacobson, my son-by-marriage, and you can hear it if you go to www.jayjacobson.com and click on the photo of Jay near a window with shadows and the title Lonely Motel. Even if you are not a fan of country, I think you will love this single. When you go to the site, the first thing you will hear is the title from his newesy CD Get Ready. But just click on Lonely Motel and you will hear an excerpt. You are currently browsing the Menupause weblog archives for June, 2009.